Seriously guys, this is one of the best soups I’ve really, really enjoyed in a long time. Flavorful, addicting, both sweet and spicy, and incredibly good for you. It made over the weekend as grand fluffy snowflakes fell outside. The streets were empty and I appreciated the ability to cozy up at home with an excuse of why I didn’t have to go out on a Saturday (too much snow!). Also, let’s face it: Staying in is the new going out. Also, can we talk about all the other goodness happening in this recipe? 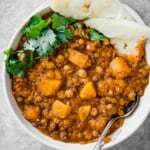 If you remember from a few earlier recipes, I challenged myself to enjoy more pulses (dry beans, dry peas, chickpeas and lentils) this past year. It’s been so wonderful introducing Tony to new foods and getting various sources of plant-based protein into his diet. For this soup, I decided on chickpeas because of their wonderful texture. 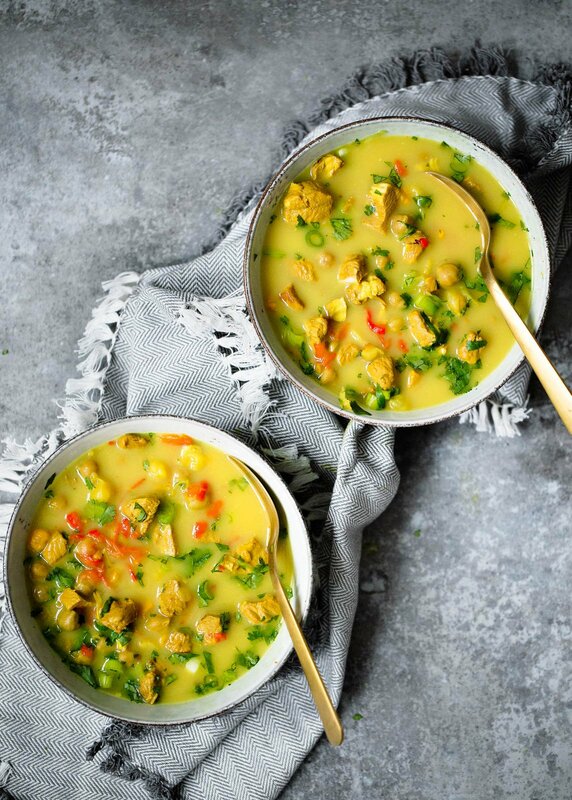 This soup itself boasts robust flavor and bright color thanks to the anti-inflammatory root turmeric and ginger. In reality turmeric isn’t just about being cool and millennial and adding it to all your smoothies, it’s tasty and beautiful in color. 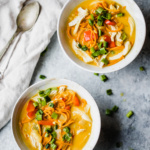 In this recipe it creates the most vibrant, tasty broth when mixed with ginger, coconut milk and a touch of peanut butter. The broth that wraps around tender chicken, sweet potatoes and those little chickpeas. I hope you enjoy this wonderful soup. It’ll fill your home with love, wonderful smells and warmth. xo! 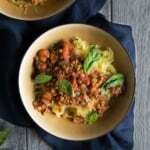 Looking for more pulse recipes? Check out PulsePledge.com and sign-up to take the Pulse Pledge with me – a commitment to eating more pulses this year. If you haven’t yet heard, the UN named 2016 the International Year of Pulses, to bring awareness to this nutritious, sustainable, affordable and delicious superfood! See how to make the soup here! 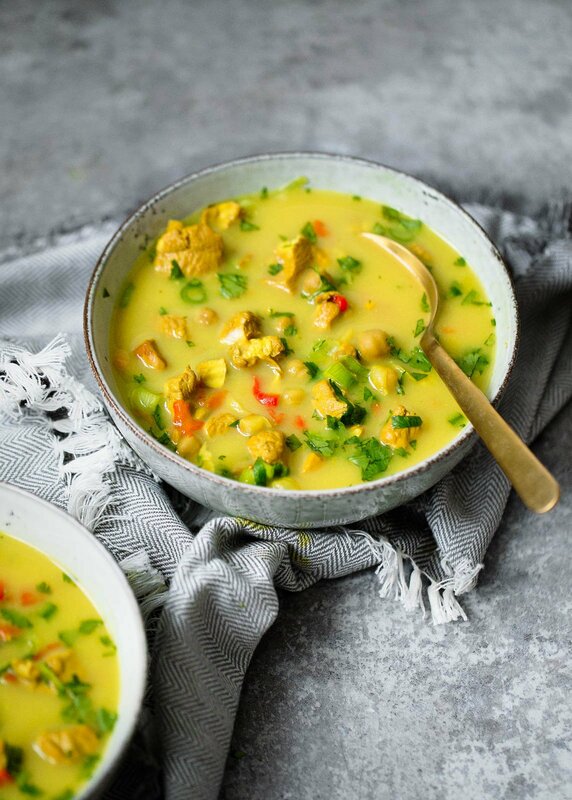 A healing winter dish: Turmeric Chicken Soup with chickpeas and sweet potatoes. Flavored with ginger, garlic, coconut milk and a touch of peanut butter. 381 calories & 33g protein per serving! Heat coconut oil in a large pot over medium high heat. Once oil is hot, add in garlic, ginger, jalapenos and chicken breast. Brown chicken for 3-4 minutes, then stir in onion, red pepper and sweet potato cubes. Cook for several minutes, stirring occasionally until sweet potatoes begin to slightly soften and chicken is no longer pink; this should take no longer than 5-7 minutes. Add in turmeric; stirring to coat the chicken and veggies. Next add in the following: chicken broth, chickpeas, peanut butter, coconut milk, salt and pepper. Stir to combine, then bring soup to a boil, reduce heat to low and simmer uncovered for 20-30 minutes or until sweet potatoes are tender. Taste and adjust seasonings as necessary. If you want more heat, add in a few dashes of hot sauce. Ladle into bowls and top with cilantro and green onions. Serves 4. To make vegan/vegetarian: If you want to make this recipe vegetarian, simply add in another can of chickpeas instead of chicken. If you are allergic to peanuts, you can omit, or use cashew butter instead. I would not recommend using any other nut butter. Make it with leftover chicken: If you have leftover chicken, you can sub 2 cups of shredded chicken instead of cooking it during the process. This post is sponsored by USA Pulses & Pulse Canada as 2016 is the Year of the Pulses! Thanks for continuing to support AK and the brands that help make this site possible. 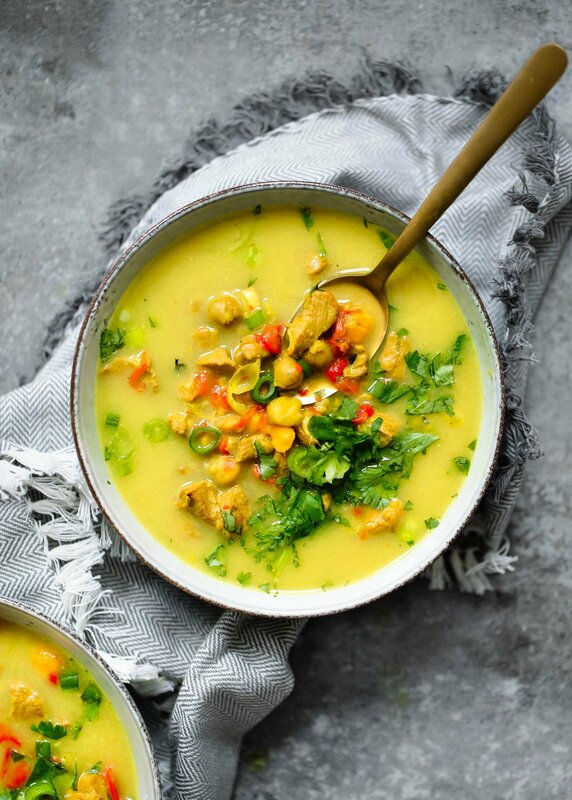 80 Responses to "Golden Turmeric Chickpea Chicken Soup"
Oh this looks amazing! Perfect for this polar vortex, lunch time is always a search for the warmest thing ha have a great day! Hi Monique! Wow! What a great looking bowl of soup! Turmeric is one of fave spices, full of good things for your body! Thanks for the great recipe, looking forward to making this today! You can use regular milk if you’d like, I just prefer coconut milk for flavor and texture in this version! Can’t wait to try this Monique! Looks good and I appreciate the nutritional break down information. I try to stay around 400 per meal and this soup looks like a complete meal with lots of fiber too. This looks so good! Perfect for these cold winter nights! I’ve been looking for more ways to use tumeric. Thanks for the recipe! 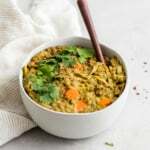 Hi Monique, I just made this with curry powder instead of just turmeric and it’s now my new favorite soup. Wind chill here is -25 deg. so staying home, sipping on your soup, watching Shrek with my dog….Life is good! I made this soup today. It was an instant hit with my visiting daughter and son-in-law. When I asked what part of dinner did they like best, the answer was the soup! I thought they would say the jumbo shrimp cocktail. Will definitely make this soup over and over again. I just made the soup and it’s AWESOME. I make soup every weekend in the winter months and it’s so nice to add some variation. This healthful bowl is perfect. Thanks! This looks so cozy! I think I’ll swap the chicken for tofu and add this to next week’s meal prep. YUM. It’s so chilly in my apartment right now and this soup looks so cozy and delicious! Also, these photos are beautiful – so bright and colorful! Just making this tonight with lentils instead of chicken. Can’t wait to try it ! This looks absolutely scrumptious, and I love the mixture of flavors you put in here! Turmeric is so good for you, and I’m always looking for new ways to cook with it. Definitely adding this to my to-make list! This looks so cozy and warm. I am totally making this! Madie it and it’s awesome! Used a little less chicken broth and it’s a very rich dish. Yum!!! My whole family really loves this soup! Even my kiddos! thanks:) It gets better with a day or two in the fridge as well. This soup is absolutely delicious!!! Thank you for a creative, flavorful, warming soup!! Sooo it might be summer but I was craving this soup!! Definitely my comfort go-to soup… even when it’s 80 degrees outside. That’s how good it is! 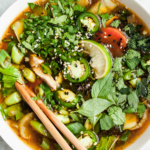 I’ve been craving soup lately too – so crazy! And love this one…so glad you enjoyed! This soup is delicious! However for us the jalepenos did not provide enough heat, I added cumin and red curry powder for a little more. This complemented the flavor of the soup perfectly! I haven’t tried it so I’m not 100% sure about the timing, but I think that should work! This soup has become a family favorite. I always add a second can of chickpeas, and have substituted shrimp for the chicken, which is also delicious. Just had to say thank you for the recipe. I’m making a batch for dinner tonight. Hi Lauren! In this recipe the coconut milk is essential for the flavor in the soup as it’s what creates the broth. I wouldn’t recommend almond milk mixed in here! I made this tonight, and it is truly glorious! After a blizzard and a few weeks of FREEZING temps in Boston this simply warmed my soul. Not to mention it is SO delicious and healthy. I didn’t change anything about the recipe, it was perfect, thank you! This soup is simply amazing. I keep returning to it over and over again. The first time I left the potatoes out, just baked them separately since my son is adverse to them. And most recently I didn’t have any red bell pepper on hand so substituted some leftover Romesco soup I had made the day before. All in all this is a wonderful delicious and feels so healing meal. We made this again last night for the umpteenth time. I had to come here today to say Thank You. This is one of our most favorite dishes. We love making it together & are always amazed how incredible it tastes. We use this as a refrigerator clean out dish, every vegetable goes wonderful in it! Thank you!!! This is possibly the best soup I have ever had. I have made it multiple times and my family asks for it over and over. I use carrots instead of sweet potatoes, add an extra can of garbanzos because I love them, and sometimes use shrimp instead of chicken. I’m going to have a big bowl right now! I’m so happy to hear that, Amy! Your swaps and add-ins sound absolutely delicious. Enjoy! Best. Soup. Ever. I’ve had this recipe saved on Insta for some time and finally got around to making it. It is full of flavor, texture and super creamy without feeling like you chugged a bottle of heavy cream. I’ll be making this time and time again. Thank you!! Looks great! 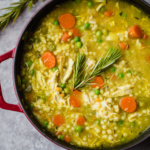 Can I substitute veggie stock for chicken broth? Can I use regular potatoes. Sure! 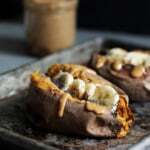 I like using sweet potatoes for their flavor, but regular potatoes will work here too. Enjoy this soup so much. It has become a regular in our home. Thanks for a great recipe!! Ours turned out incredibly bland. I’m not sure why; my only guess is that we tend to make incredibly flavorful food and maybe the previous reviewers are used to more subtle flavors? However, with a few tweaks, we loved this soup. We added a lot of extra salt, 2 additional tablespoons of peanut butter, and a few tablespoons of curry powder. I loved dipping garlic naan in my bowl. Next time I may try cooking the chicken in yellow curry paste in lieu of adding curry powder. Carrots would also be a great addition. I’m surprised to hear that! I do like my recipes super flavorful. It could be the brand of spices used, too (some curry powders have a kick of heat, etc.) Glad you enjoyed this one with some additions! Hi Monique. I just discovered this recipe at the bottom of your list of 16 slow cooker recipes. I can’t believe I missed it when you posted it originally! One question – the recipe calls for 1 cup of coconut milk, but the video uses the entire can; which should it be? Thanks! Thanks, Monique! I’m making this tomorrow. It sounds perfect for a cold VA day! I made this tonight for dinner; it’s another favorite! I took the shortcut with rotisserie chicken, used 3 cups of chicken broth and added 1 cup of peas at the end. Beautiful and delicious! Thank you for another great recipe! The perfect shortcut! Glad you loved this one, Connie! I made this soup tonight and LOVE it! So yummy and filling. The only thing I changed was to replace the jalapeno peppers with one roasted poblano and a sprinkle of red pepper flakes. This one’s a permanent add to my recipes. Delicious! So happy you loved this one. Sure! I would just add the quinoa a bit later in the process so that it doesn’t get overcooked (cooking for just about 15 minutes or so). This has become my favorite soup! The turmeric is so bright! I add a little cumin and garam masala before simmering, as well. 🙂 I had no coconut milk tonight, so substituted almond milk, and it actually turned out just fine (I still think the coconut milk is preferred, but it was still YUMMMMM). Thanks! So happy to hear that! Cumin + garam masala sounds delicious. I’ve made this before and loved it! Wondering what type of seafood would be the best substitute for chicken…thinking shrimp might be tasty with this flavor profile. I am feeding a pescatarian (no meat, but seafood is ok) and will use homemade veggie broth. Thanks for your expert advice, it’s much appreciated. I love this recipe. So tasty and nourishing. I’ve got a batch on the stove right now. I added kale this time because I had extra on hand. I like to make pot of this and then freeze portions for easy lunches. I’ve got 3 kids under 5, so it’s a treat to know I can grab something tasty and healthy. Love the addition of kale! Perfect for meal prep lunches. We love your soup! Our new favorite! 5 stars! Do you use natural peanut butter that has no added sweetener?